The 40.9 million tonnes of cargo that passed through the Seaway system in 2018 was 6.7 per cent higher than in 2017, and the best result since 2007. More than 12 million tonnes of grain passed through the waterway, the largest amount in two decades, and accounted for almost 20 per cent of the traffic. Dry bulk goods shipments came in at 10.7 million tonnes followed by iron ore at 7.3 million tonnes, trailed by liquid bulk, general cargo and coal. SLSMC has announced a toll rate increase of 1 per cent for the 2019 navigation season. As opening day approaches, a close watch is kept on ice conditions on the Great Lakes, which in recent years have disrupted the opening of navigation in many parts of the waterway. In late February, the U.S. National Oceanic and Atmospheric Agency’s Great Lakes Environmental Research Laboratory reported overall Great Lakes ice coverage to be just over 60 per cent. While it’s not as bad as conditions in 2014 and 2015 that hindered navigation for weeks after the Seaway opened, icebreaking would appear to be need at least in Lake Superior and the St. Clair River. The Great Lakes Environmental Research Laboratory reported that more than three-quarters of Lake Superior is covered in ice right now, making it an above average winter for ice. The thickest is in the Thunder Bay area. Coast Guard spokeswoman Carol Launderville said it would have five ships assigned to icebreaking and buoy tending in the Seaway. If ice conditions are severe, then at least one additional icebreaker will be sent to Lake Superior. Terence Bowles, SLSMC’s President and CEO, said technology modernization has made the waterway more competitive. The introduction of Hands Free Mooring and remote operation of locks from centralized operation control centres represents the greatest advancement in operations since the Seaway opened. “It is gratifying to see that our efforts to boost system efficiency and heighten our competitive position are bearing strong results,” he said. “With the elimination of tie-up lines for most vessels, Seaway employees and vessel crews face fewer safety risks, and vessels experience less wear and tear as they enter and exit locks. This new mooring technology eliminates the need for special vessel fittings, enabling the Seaway to welcome a broader range of ships from the world fleet. “With strong advancements in efficiency, safety and flexibility, the stage has been set for a Seaway that will effectively serve its stakeholders for decades to come. We can truly say that we are ready for the future!” he said. The Highway H2O program has also helped boost traffic on the Seaway. Craig Middlebrook, Deputy Administrator of the U.S. Seaway Development Corp. said, “Total tonnage on the Seaway exceeded the 5-, 10-, and 15-year averages, making 2018 an exceptionally strong shipping season. In particular, we were pleased to see heightened activity on the Seaway in December. The investments in Seaway infrastructure and technology are achieving greater efficiencies for our customers and enhancing the binational waterway’s global competitiveness,” he said. Mark McCormack, Transportation Manager for Parrish & Heimbecker, said the company had a great year in 2018 moving grain through the Seaway and expects “it should stay relatively the same” this year. 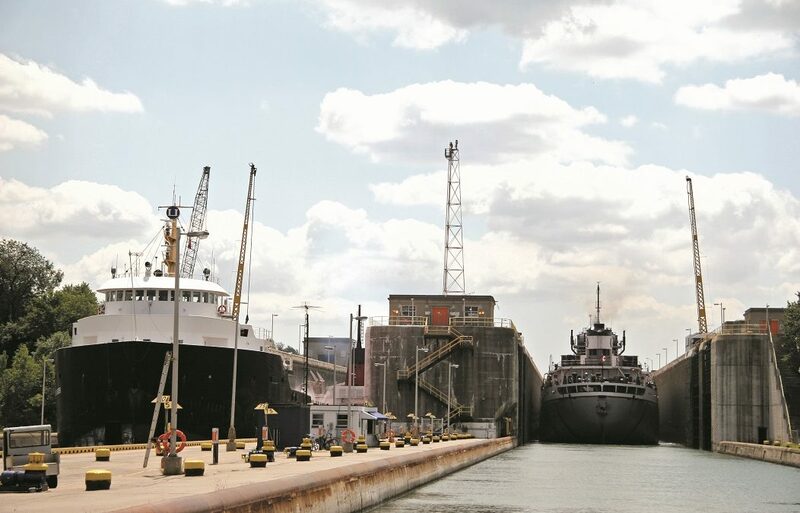 While Prairie-produced grain remains the staple of P&H’s shipments from Thunder Bay, “we’ve seen a healthy increase in exports of Ontario grown grain during the last four to five years.” P&H loads grain on ships from its terminals in Hamilton, Goderich, Owen Sound and Port Colborne. Its Toledo facility ships American grain through the Seaway. One commodity that could see increased movements this year is road salt, which was in tight supply in Ontario this winter, because of problems with North American suppliers last year. A three month strike at a Goderich area salt mine and problems Cargill’s Cleveland area salt mine added to the shortages caused by greater than projected use of road salt during the winter of 2017-18.